Syrian President Bashar al-Assad told U.N. Secretary General Ban Ki-moon in a phone conversation Wednesday that military and police operations in Syria had stopped, according to a U.N. statement. The secretary general's office released a read-out of the conversation, during which, according to the statement, Ban also expressed alarm at reports of human rights violation in Syria. U.S. stocks ended a thinly traded session mixed Wednesday as investors weighed the latest corporate results against global economic and debt concerns. The Dow Jones industrial average rose 4 points, or less than 0.1%, to close at 11,410. The S&P 500 added 1 point to 1,193. The Nasdaq composite fell 12 points to 2,511. Reality stars like Kim Kardashian, center, aren't always embraced by the public. Reality TV star Kim Kardashian’s upcoming marriage to NBA player Kris Humphries on August 20 is creating a media circus. People magazine is reportedly paying between $300,000 and $1 million for exclusive pictures of the wedding, and a four-hour-long TV special will air on E! (in two parts) on October 9-10 showcasing the nuptials. CNN.com’s story about the hoopla drew serious ire from readers. MatiValhalla said, “A quick anagram of Kardashian = "A Kinda Rash." The death and discord plaguing Syria hit home for the United Nations on Wednesday as the world body temporarily withdrew some staff members amid the violence there. The United Nations is relocating 26 non-essential international staff members and their families from Syria, said Michael Williams, the U.N. special coordinator for Lebanon. He had been concerned over the conflict in Latakia, the port city where Syrian forces kicked off an offensive this weekend. There are normally more than 160 international U.N. staffers in Syria, with many of them based in Damascus, a spokesman said. The largest U.N. agency in Syria has been the U.N. High Commissioner for Refugees, with a total of 61. The U.N. Human Rights Council is also concerned over the unrest. It plans to hold a special session Monday regarding the situation in Syria, according to Cedric Sepe, press officer at the Office of the High Commissioner for Human Rights. He said member states have called for the session, in Geneva, Switzerland, and it may spill into the next day. These moves reflect international anxiety and outrage among world powers, including the United States, and among Syria's neighbors, including Jordan and Turkey, over the crackdown. Tunisia has recalled its ambassador to Syria for "consultations," the Tunisian news agency said Wednesday, citing an "authorized" Foreign Ministry source. "This measure was taken as a result of the recent dangerous developments in Syria," the source reportedly said. Last week, Saudi King Abdullah called for an end to the bloodshed in Syria and recalled the Saudi ambassador from Damascus. Bahrain and Kuwait also have recalled their ambassadors from Syria and called on the Bashar al-Assad regime to end crackdowns. While the government has maintained that it is targeting "armed groups" and "terrorists" during the country's five-month long unrest, witnesses and activists say the government has been brutally cracking down on civilians amid calls for al-Assad's ouster. Reports of violence persisted Wednesday. 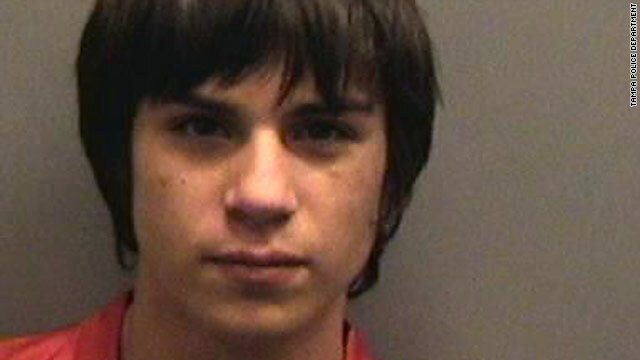 Jared Cano, 17, had plans that indicated that he intended to detonate explosive devices at his school, police say. [Updated at 1:13 p.m.] Tampa police said they were able to thwart a mass murder plot that was planned for the first day of classes next Tuesday. Tampa Police Chief Jane Castor said that police were able to stop a former student from carrying out what could have been a "a potentially catastrophic event" thanks to a tip from a citizen who came forward. Hillsborough School District spokesman Steve Hegarty confirmed to CNN that a former student, who hasn't attended Freedom High School for a year and a half, had been arrested in connection with the alleged plot. Castor said there was no indication anyone else besides the one suspect was involved in the plot. That student allegedly had planned to kill 32 people, including two principals, according to the St. Petersburg Times. Tampa Police officers received a tip about the plot at 11:50 a.m. on Tuesday, police said. Chief Jane Castor said during the search officers found a minute-by-minute manifesto showing what the suspect planned to do on the first day of school. Police also found materials that could have been used to make explosives including fuel sources, shrapnel, a timing device and fusing devices. Along with the manifesto police said they also found "schematic drawings of rooms inside Freedom High School and disturbing statements about [Cano's] intent to kill." Editor's note: Tune in to “Nancy Grace” at 8 p.m. ET on HLN for updates from Aruba on an American woman who recently disappeared from the same area that Natalee Holloway vanished from in 2005. The suspect in the disappearance of a Maryland woman during a vacation in Aruba had taken out a travel insurance policy on her, an island official said Wednesday. It is too early to conclude whether the insurance policy was a possible motive for the disappearance of Robyn Gardner, Solicitor General Taco Stein told CNN. Giordano's lawyer, Michael Lopez, has not returned repeated CNN calls for comment regarding the insurance policy. According to Aruban prosecutors, the missing woman and the suspect, Gary Giordano, arrived on the island July 31 from the United States. Gardner was last seen August 2 near Baby Beach, on the west side of the island. Giordano told authorities that he had been snorkeling with Gardner when he signaled to her to swim back, according to a statement from the prosecutor's office. He said Gardner was nowhere to be found when he reached the beach, according to prosecutors. The T-50 performs during the MAKS 2011 air show outside Moscow. It is meant to rival the U.S. F-22 Raptor. Russia's new stealth fighter jet made its public debut Tuesday, according to state-run news source RIA Novosti. The Sukhoi T-50, developed collaboratively by Russia and India, appeared at the MAKS 2011 air show in Zhukovsky, outside Moscow. 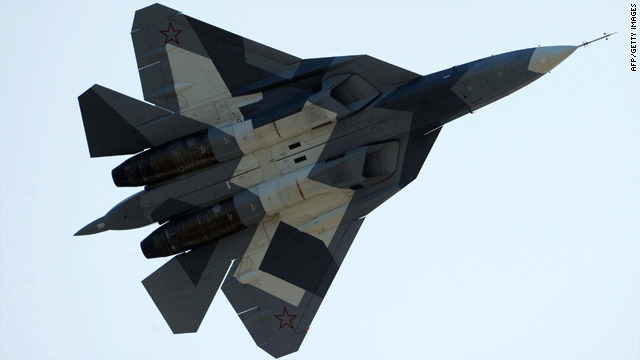 Gen. Alexander Zelin, head of the Russian air force, told RIA Novosti he expects the T-50 prototype to be ready in 2013, with "mass-produced aircraft" arriving in 2014 or 2015. The aircraft is expected to become a staple of airborne defense for both Russia and India, Mikhail Pogosyan, head of Russia's United Aircraft Corp., told RIA Novosti. "The T-50 will be the newest main plane both for the Russian and the Indian air force," Pogosyan said. The article from the state-run media source says the Sukhoi T-50 cost the two governments about $6 billion to develop, with India shouldering about 35% of the cost. It is intended to match the U.S. F-22 raptor. Back to school in Joplin - Wednesday is the start of the school year for students in Joplin, Missouri, a bittersweet time for a town still rebuilding from a May tornado that killed more than 150 people. For Joplin's 2,200 high school students, reopening the schools means separating grades that usually study in the same building. Ninth- and 10th-graders will go to an existing middle school, while upperclassmen will attend classes at a mall. Officials say the mall was the only place big enough to house the students. The school district spent $5.5 million to convert a 95,000-square-foot retail facility. "Every time I drive by it, it's still really sad," said senior Lydia McAllister, looking at the ruins of Joplin High School, one of 10 school buildings damaged or destroyed by the storm. 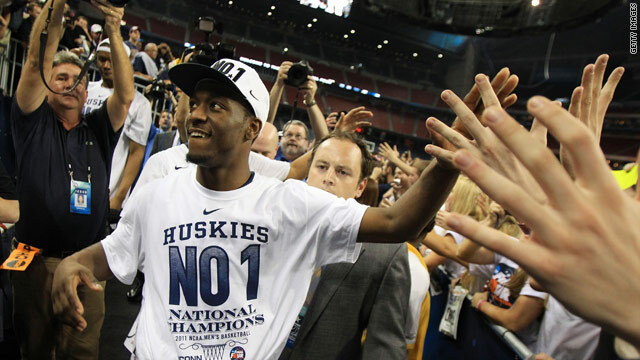 UConn;s Kemba Walker sports a No. 1 shirt after winning the NCAA championship, but under new rules his team wouldn't have made it to the dance. NCAA's stricter academic rules: What does it mean for your team? The NCAA is raising its academic requirements for postseason competition, including bowl games and March Madness, the organization announced Thursday in a news release. Had the new rules been in effect during the 2010-11 academic year, the University of Connecticut would not have been able to compete in (and win) the NCAA basketball tournament. Syracuse and Florida State would have also been barred from the Big Dance, and the University of Southern California wouldn't have qualified for the "First Four" play-in game it lost to Virginia Commonwealth. The NCAA calculates an academic progress rate that measures retention and graduation rates for every Division I team, reflecting the previous four academic years. The score comes out to a number as high as 1,000. Since its introduction in 2005, teams with APRs below 925 would face penalties, such as losing scholarships. Postseason bans would be issued only after three consecutive years of APRs below 900. When the new rule is in full effect, only teams that have APRs of at least 930 will be able to compete in the postseason, according to a NCAA news release. The new rule will be gradually implemented over the next five years. An APR of 930 comes out to a 50% graduation rate, according to the news release. We're more than a year away from the presidential election, yet the race to the White House is already at full speed. Watch CNN.com Live for continuing coverage of the presidential campaign. 7:45 am ET - Race to 2012: Rick Perry breakfast talk - GOP presidential candidate Gov. Rick Perry speaks at a "Politics and Eggs" breakfast in Bedford, New Hampshire.